Ironstone are often asked for advice or recommendations on the values and options for guitar tone controls. There is plenty of very detailed information on the web, so this article is intended to be a primer for the interested guitarist / hobbyist. While there are differences in how they are applied for different guitar and pickup constructions, the electrical principles of capacitor and resistor tone controls are of course common. But as a start point, the Stratocaster tone control example will be used, (see later for Humbucker and telecaster derivatives). 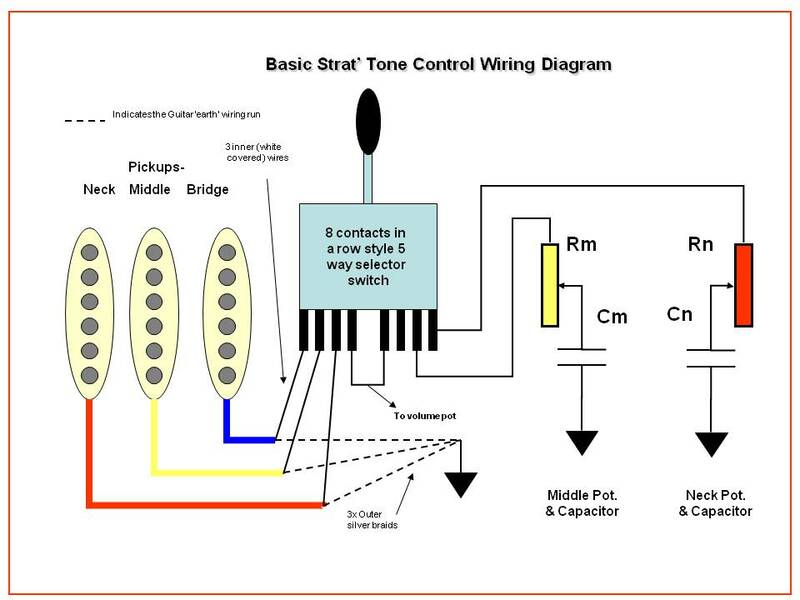 The diagram shows an electronic representation of the components that make up a Strat tone circuit. Often referred to as a 'Tone Stack' in amplifier or pedal circuits, it is no more than a simple capacitor plus resistor low pass circuit, meaning it has the ability to pass lower frequencies (to the output) and 'bleed' higher frequencies away to the signal ground. Turning the tone knobs alters the potentiometer (pot) value and thus alters the amount of treble signal 'lost' from the output. For completeness in the diagram, both the Neck and Middle pups are shown with an individual pot (Rn & Rm) and capacitor (Cn & Cm), and the Bridge has no tone control connected. In practise, most Strats are configured without a Bridge tone control, but have just one capacitor shared (i.e. both pots connect to one side of one capacitor) between the Middle and Neck controls. Of course these changes were not in isolation, with pickup design / winding levels varying too! Pots are simply curved tracks of resistive material over which a wiper is moved, altering the resistance between the wiper and track ends. Pots are defined by their value (normally 250 K Ohm or 500K Ohm for guitars) and 'taper'. By far the most common value for single coils is 250 K (250,000 Ohms), the same value being used for all 3 pots. Increasing the value to 500K will make the overall guitar sound brighter. Typically this will make cheaper pickups start to sound harsh and brittle. But if you want a brighter sound, several Ironstone customers have used 500K pots and reported the tone stays very clear. Overall, 250K would be the normal recommendation. Pots are available with two 'taper' styles, simply meaning the way that the resistance changes as the knob (and thus wiper on the resistive track)) is moved. The 'B' or linear taper is just that - with the knob turned up / down half way the resistance between the wiper and either of the ends of the pot will be 1/2 the total pot resistance (125K for a 250K pot etc.). The 'A' Audio / Log taper has the resistive track manufactured in a non linear (logarithmic) way, meaning that the resistance changes faster at one end of the pot's travel than the other. The human ear responds to volume in this way (dB is a logarithmic measure of sound pressure) and so the 'A' style is almost always used for the volume control at least. Different manufactures use either A or B styles for their tone pots. Fender use A style for all 3 pots and that would be the Ironstone recommendation for the smoothest range of tone control operation (avoiding the rather on / off tone control feeling that many guitars suffer from). Caps are manufactured in a wide variety of ways, but (for the values used in guitars) can be imagined as two conductive sheets (foils) separated from each other by a very small distance and a suitable insulating material (e.g. paper). Caps are defined by their construction type, value, and operating voltage. The sonic effect of different cap constructions is a matter of hot debate if you have a look across the internet! I think it would be fair to say that whilst every guitar component has some sonic impact, the cap is probably one of the most subtle. This is partly because the purpose of the cap is to remove treble from the final signal, so you are not hearing a caps contribution, but rather its subtraction from the guitars tone. Of course the effect of different caps is greatly lessened if the tone control is set up near its 10 position. There are many excellent quality caps out there on the market. Its for the individual to determine if the cost is reflected in any tonal improvement of course. Capacitance is measured in Farads. At the level guitars need, it requires only small decimal fractions of a Farad, the micro and nano Farad. As an example, 22 nano Farad is the same as 0.022 micro Farad and you will see caps of the same value specified either way. There are 3 typically quoted Strat' cap values associated with Strat tone stacks, 22nF (0.022mF), 33nF (0.033mF) and 47nF (0.047mF). The bigger the cap (e.g. 47nF), the more treble will be lost from the signal for any given guitar tone knob setting. As individual components, Bigger Capacitor Values: Block more Bass and Transmit more Treble. If there is such a thing as the most common cap, its probably 33nF. This will cut out more treble in a guitar tone circuit than a 22nF but leaves a good strong mid-range. Given the fact that cheaper ceramic pickups have a tendency to harshness, 33nF is a good 'leveller' of tone for them. But partnered with a good set of pickups where clean brights are desirable along with a good overall balance and plenty of mids, 22nF would be the Ironstone recommendation. The most obvious initial tone control difference Strat' to Tele' is that from their inception, Tele's were equipped with just one 'Master' tone control, operating on all pickup switch positions. From a historic perspective, that is actually not the complete story, as the 1953 wiring layout included a 'deep rhythm' option from the 3 way switch, of neck pickup with a 0.1 mF capacitor shunting the output directly to the guitar ground - producing a dense 'blanket over the speakers' bass only tone. At the same time the 'tone' control actually acted as a blender of the 2 pickups rather than pure tone adjustment. These early variants are covered in detail in 'The Fender Telecaster' by A.R. Duchossoir ISBN 0-7935-0860-6. By 1967, the 3 way switching of Neck / Neck + Bridge / Bridge, that can be regarded as the modern standard was established. The tone control had now become a true tone control. Both it and the volume pot had for periods been 1M Ohm in value, but settled to a more conventional 250K by 1983. Capacitor wise, the 47nF value had been a reasonably constant feature from the start. However this value does give a very dark tone when the tone pot is fully turned down and values from 22-47nF have been used during the Tele's production history. Tonally, one of the distinguishing features of the Tele is the Bridge pickups 'twang' and brightness, partially as a result of the magnetic field focussing due to its metal 'under plate'. In some situations this is highly desirable, in others it needs a little taming. As always its a compromise, but the ironstone recommendation would be 250K potentiometers and a 33nF tone capacitor. Note that 500K pots are the normal value when used with humbucker pickups, where the extra brightness is needed to compensate for some of the darker tones that humbucker construction generates. From the capacitor section (see above), smaller capacitance values will add brightness, so a 22nF will help keep a set of humbuckers nice and crisp and avoid too much 'darkness'. Looking at humbucker wiring diagrams also reveals how unlike a Strat' or Tele', the tone and volume circuits for a particular pickup are often only switched into circuit when that pickup is selected - again part of minimising the loading on the treble content of humbuckers. All of the tone options described so far operate on the same principle, a fixed capacitor and variable resistor shunting increasing amounts of treble out of the guitars output signal. In the mid 1980's Fender came up with a different approach, named the TBX ( Treble and Bass Expander) control. Based on 2 potentiometers (1m and 250K) stacked together and operated by a common shaft, the TBX can remove bass as well as treble. Starting to turn up from 0 on the dial, the TBX operates like all of the tone controls described above, until its mid way (5 on the dial setting) which is like a normal tone control at its maximum setting. From 5 to 10 on the dial, the TBX operates differently, gradually reducing the guitar signal's bass content. The audible effect is of a gradually brighter, crisper tone emerging. Though of course no passive circuitry can actually 'add' to the raw pickup tone, the TBX is a novel solution that allows a different tonal mix by the 'subtraction' of either treble or bass. So with all this variety, there are plenty of options to explore if you want. The following are aimed at Stratocasters, but can be used on other guitars as appropriate. > Disconnecting the capacitor connection to 'ground' (normally the tone pots metal body) with a small simple switch will allow the guitar to be run free of the tone stack for the purist tones. If you only ever have the tone knobs at 10 why not try it! The same effect is used with Fenders own special 'no-load' pot that has a switch built in at no. 10. > The TBX mentioned above is an interesting variant to experiment with, though its construction means its not something that can easily be manufactured in a DIY sense. Finally, if you are really keen, you could replace the tone cap with a couple of flying leads coming out from the scratchplate and terminating in a couple of croc. clips of similar. Then you can experiment with differing values and styles of capacitor to your hearts content!